Stop in to see our great selection of family jewelry, diamond rings, necklaces, watches, and other fine jewelry. We offer repair services for any of your jewelry. Everything from ring sizing to rebuilding a mounting. We also offer a jewelry cleaning service at no charge to our customers. Peets Jewelers offers a great selection of family jewelry, diamond rings, necklaces, watches, and other fine jewelry to Massena, Potsdam, Canton, Ogdensburg, Awkesasne, Malone, and surrounding communities. No matter the occasion, we have a large selection of fine jewelry for you to choose from, offered at incredible prices! We welcome you to stop by our store located at 10 Phillips Street in Massena, NY. 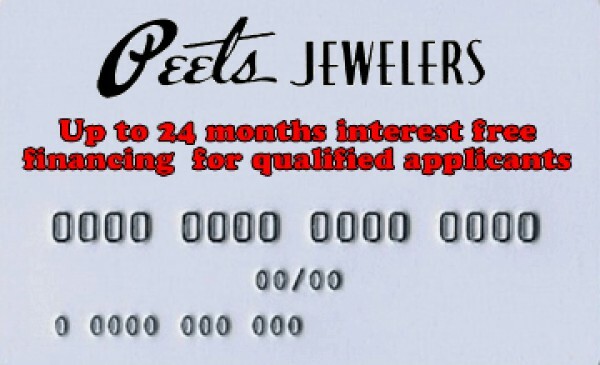 Our customers receive great quality jewelry & the personal service that Peets Jewelers is known for. Peets Jewelers has been around for over 65 years! Since day one we have been committed to our customers' satisfaction.